Katrina Barbour is a local make-up artist that specializes in bringing out the natural beauty of a woman. Based in the Maryland area, Katrina is available for proms, weddings, runway, photo shoots and personal service. She was the lead makeup artist for the Fox 45 Segment on What to Wear to Thanksgiving dinner, VIP Exclusive Fashion Shows at the Empire Hotel for New York Fashion Week, the Gaylord in Washington, DC and the Italian Embassy in Washington, DC. and the 2015 Delta Fashion Show. She was also the lead makeup artist for 2 local stage plays Stomp the Devil and Love Under New Management. 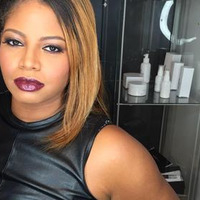 Her talents have taken her to the glam teams for Crystal Couture, Golden Scissors Awards, Blacks in Wax, Maryland Fashion Awards, the Delta Fashion Show 2014, and Maryland Fashion Week to name a few. Her freelance work has taken her to the counters of Laura Mercier and Bobbi Brown. Katrina's work can be seen in the pages of Model Call Magazine Modern Luxury and Beyond Curves Magazine. Katrina was also a featured artist in the August 2014 Raw Artists Allure Showcase in Washington, DC. Katrina also believes in giving back. She was a part of the glam team for TLC’s Say Yes to the Prom. A project for underprivileged young ladies to receive donated dresses and services for prom. Katrina was voted 2014 Best Makeup Artist in Prince Georges County and the 2015 Titan Awards Makeup Artist of the Year. Be Fierce... Be Fabulous... Be You!